Water and wind are two of the first sources of renewable energy used by man in Britain. Hatfield is known to have had mills since at least the 11th Century. The town still boasts of a working water-mill; which, for many years, was one of only two such mills in Britain (there have since been other restorations). The Romans are thought to have been responsible for introducing the water-mill concept to Britain. 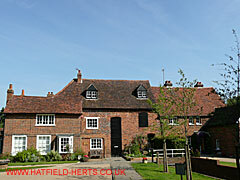 According to Hatfield’s entry in the Domesday Book there were four mills in Hatfield. These almost certainly would have been water-mills, as the first recorded use of windmills in Britain dates back to the late 12th Century (although they are thought to have originated in ancient Persia – modern day Iran – around the 9th Century). It is possible that this total relates to the number of millstones in use and not the number of mills. However, there are still working mills at Mill Green and in Hatfield Park (sawmill for timber), while there is a paper-mill site near Bush Hall and converted mills at Essendon and Lemsford. The Mill Green Mill (pictured above, was previously called the Hatfield Mill or Bishop’s Mill) is open to the public, still mills flour (on set days only), and is home to the Welwyn Hatfield Museum. It is thought to stand on the site of one of the Domesday Book mills. Originally owned by the Bishop of Ely, the title of the Hatfield Mill passed to the Crown and then to the Cecil family who built Hatfield House (whose descendants include the current Marquess of Salisbury). They leased the mill out to various people over the years – while many were from London they employed local people to work the mill. Over time, the mill has been extended and renovated, so its exterior does not reflect its true age. The mill has had at least one famous visitor – the children’s author, Beatrix Potter, who painted a watercolour of the mill in 1910. Centuries of milling at the Hatfield Mill came to an end when the last miller, Thomas Lawrence, emigrated to Australia in 1911. While the buildings were kept in use the machinery fell into a state of disrepair. Fortunately, the Hatfield and District Archaeological Society took over the tenancy in 1973, and held a number of fundraising exhibitions. In 1978 Welwyn Hatfield District Council (now called Welwyn Hatfield Borough Council) took over financial responsibility and set up a museum service. In 1979 restoration work started after the Mill Green Water Mill Restoration Trust was set up (in the same year, the mill house was opened as a full-time local museum). Work was carried out by the Hatfield and District Archaeological Society and Millwrights International Limited. Around seven years and around £100,000 later, on 8 August 1986, the Mill Green Museum and Mill was officially reopened. Thanks to their efforts a centuries old tradition is kept alive, and flour is still milled using nothing more polluting than water and gravity in Hatfield to this day. For more details read Mill Green Mill – A Short History and Guide by Sue Kirby, published in 1990 and available at the museum shop.